Marília Lobo is Director of Strategy and Learning Innovation at the Berlin School where she aligns the school’s program development strategies, community, and marketing to foster business growth and cutting-edge educational offerings. A native of Brazil, Marília is an enthusiastic and highly skilled creative entrepreneur. Whose non-traditional career path started after graduation. It was at this time that she set up her own business - an award winning boutique agency dedicated to develop communication awareness and strategic thinking. As founder and managing partner, she led ‘Fina Ideia Communication and Education’ for 11 years. Her team has provided personalized projects in internal and corporate communication, change management, mergers & acquisitions, corporate culture and executive learning to an extensive range of customers, including the largest brands across all verticals, such as Avon, Braskem, CNN, Carrefour, Duke Energy, Dupont, General Electric, Johnson & Johnson, Mercedes-Bens, Pfizer, Unilever, Volkswagen, among others. Marília believes in a vision that combines the essence of communication and education to build human capacity through lifelong learning, self-leadership, collaboration, creativity and strategic planning thus fostering human and organizational development. At the Berlin School, Marília is channelling her passion for education to leverage leading edge and pragmatically applied business approaches. She joined the team in October 2017, as Head of Strategy and Learning Innovation, where she led the launch of our community and content platform — Home of Creative Business Leadership — initiative. With this, the ambition and objectives of the Strategy and Learning Innovation unit developed. The mission of the Strategy and Learning Innovation unit is to generate a portfolio of breakthrough business growth opportunities by looking beyond the obvious; using a disciplined yet creative processes to nurture the interplay between external perspectives and the school’s internal capabilities/practices. 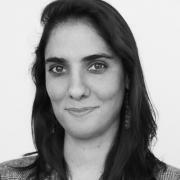 At our office in Berlin, Marília leads a collective of dedicated international personnel in marketing, corporate communication, community relations, data management and learning experience. Grounded in the ‘strategy as learning’ approach, her objective is to guide and advance the team towards collective and collaborative results. She holds a Bachelor in Public Relations, a Post Grad in Business Strategy and is an Executive MBA alumna from Class 18. Parallel to her working experience within the creative industry for several years, Marília has always been involved with educational initiatives as faculty member, visiting professor, keynote speaker and instructional design consultant for business schools and corporations.